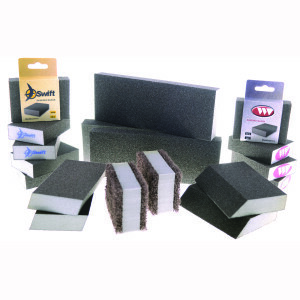 4-sided sanding blocks are one of the most popular products in our abrasive sponge range. They offer flexible, durable solutions for hand sanding applications. The sanding block family includes several shapes: Standard rectangular sponge blocks, specialist single angled sanding blocks, dual angled sanding blocks and jumbo (larger size) sanding blocks. Standard sanding blocks are made with either Aluminium Oxide or Silicon Carbide grit. Specialist sanding blocks are made with Aluminium Oxide grit. The grit type and grade determines how aggressive the sanding process will be. Grit grades with lower numbers are coarser and more aggressive. Higher grit grades are used for finer finishing. Our sponge sanding blocks are offered in a grit grade range of 36 to 220. To maintain performance, sanding blocks are washable and can be used wet or dry.